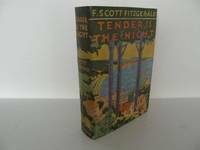 Scribners, 1934 First Edition, First Printing SIGNED by F. Scott Fitzgerald on a laid in signature. This first issue dustjacket has the blurbs by Eliot, Mencken and Rosenfeld printed on front flap. This ORIGINAL dustjacket has benefitted from some professional restoration to the spine ends and panels. The end result is a stunning dustjacket that is vibrant in color with no chips or tears to the dustjacket. The book is in nice shape. The boards are crisp with light wear to the edges. The binding is tight, and there is no writing, marks or bookplates in the book. Overall, a sharp copy of this true first edition in SIGNED by the author. We buy SIGNED Fitzgerald First Editions.. Signed by Author(s). 1st Edition. Hardcover. As New/As New.